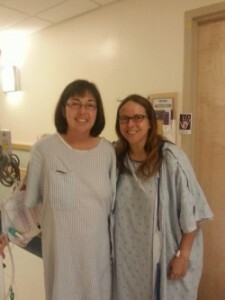 I made the decision to donate a kidney to my sister as soon as I received the news her kidneys were failing. I think for some people the question to donate is this easy: There simply is no question. My sister was facing a lifetime of dialysis or worse – as long as I could do something to prevent that, I would. Dr. Marroquin and his team did everything they could to talk me out of that decision – they really had to be sure that it was my decision and that I really, really, really, really meant it. I underwent the most extensive physical I’ve ever undergone. So many questions, so many blood tests, so many warnings; the goal of this process is to make donors look the decision to donate head-on. They want to cast doubt. Ultimately, the doubt assured me of my faith in the decision. Nothing could make me change my mind. As the day of the surgery drew closer, I became nervous. Who wouldn’t? Though I was sure of my decision and confident in Dr. Marroquin and his team, I was still anxious. For the past year, I had had a degree of control: If I could do something, I did. On the morning of the surgery, I realized I didn’t have control anymore – I had done everything I could. Now, it was up to Dr. Marroquin’s able hands and the hands of fate itself. Would my surgery be a success? How about my sister’s? Would there be complications? I could only hope for the best at that point, so that’s what I did. My surgery did turn out to be a success, as did my sister’s. There were complications, but they were handled. Looking back on it now, this is easily the best decision I’ve ever made. I have a hard time imagining I will ever do something this incredible again. My decision impacted so many lives; not only did I save my sister’s life – I also saved someone’s daughter, wife, mother, and friend. I am grateful every day for this experience. Amy deLaricheliere is a local Vermont English teacher. Aimee deLaricheliere and her sister Lisa Hartnett.